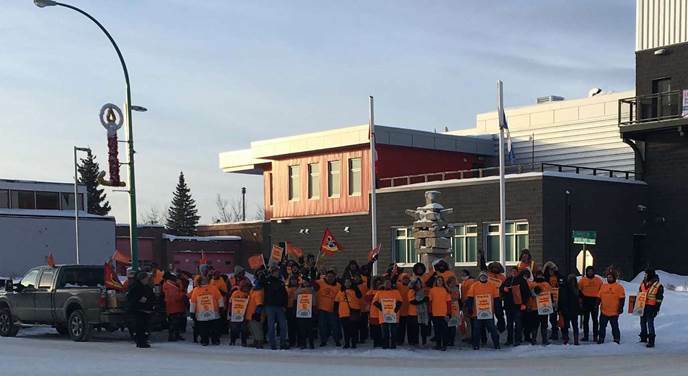 The Union of Northern Workers has announced a strike vote in Hay River will now take place January 29th. This comes after the election of a new bargaining team consisting of Alvin Pitre, Robb Ross, and Sara Swanson who were elected January 24th. A strike vote that was originally planned for January 17th was postponed due to unforeseen circumstances according to a post on the Hrhssa UNW Local 21 Facebook page. The circumstances are widely believed to due to three members of the previous bargaining team who claimed that the union had removed them earlier in January after they tried to set up more talks with their employer. The three removed members, Heather Coakwell, Ann Schreuders, and Barbara Holland said in a statement that they requested a meeting without outside lawyers and negotiators, to have open discussions about current issues and that the UNW let them go because of a predetermined agenda for the HRRSSA to strike at the same time as the GNWT and the NTPC. The UNW said that they were investigating what took place. On their website, the UNW stated that two strike vote meetings are to take place on Tuesday, January 29th at 5:15 p.m., and 7:30 p.m. at the Hay River Community Hall. UNW President Todd Parsons is expected to be in attendance.